Custom latex balloons make perfect gifts for festive season sales promotions, store openings, awareness campaigns and much more. Long lasting, environment friendly and adorable, these balloons will speak themselves for your brands! Made of 100% biodegradable natural latex, these balloons that stay afloat will hoist your brand well ahead of your competitors. ProImprint has a range of promotional latex balloons in just about any color and price range that it is never too hard to find something that match the theme of your event. Shop today and avail the lowest price match guarantee, FREE set up and artwork assistance on every order,discounts on bulk purchases, rush orders, quick shipping and much more! 100% customer satisfaction guaranteed! 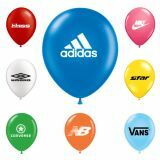 Promotional latex balloons will make all the milestones including your logo promotion a big celebration. 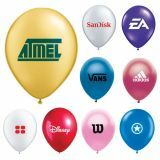 These Helium quality, latex balloons are perfect for promoting one-day sales and special events as these make delightful billboards that stay afloat for an average time of 18-24 hrs. Custom latex balloons make perfect gifts for all age groups as everyone is a kid within them! 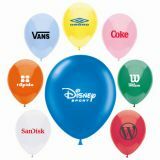 These brilliantly colored balloons that are imprinted with your logo, artwork and business message will instantly gain the attention of everyone. Balloons add a festive mood to any gathering and occasion and that is what makes these perfect gifts for birthdays, milestone celebrations, weddings or corporate parties. Our balloons ensure budget friendly promotion that will subtly complement any celebrations or festivities. 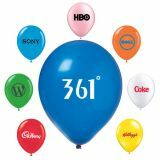 Logo imprinted latex balloons that were invented in 1824 have evolved to be potent promotional items over the years. These are great for both outdoor and indoor use and can be used to promote a diverse lineup of businesses like realtors, spa, fashion stores, corporate brands, exhibitions and fund raising events among others. 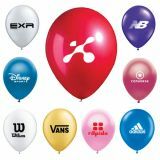 Imprint your logo and contact details on these brilliantly colored balloons and tie around in your tradeshow booth to impress and attract your audience. Personalized latex balloons can make your business stand out even in crowded streets without much effort. Logo imprinted balloons will make your brand look delightfully different from the countless others and your recipients will never fail to take note of it. Helium-quality latex balloons make colorful and eye catching offer a colorful, cost-effective way to rise above competing messages and attract attention.At times the most effective promotional handouts happen to be the simplest as in the case of these printed promo balloons which enjoy ubiquitous appeal in party and promotional circuits. Balloons make a low cost way to rise above competitors and attract attention as these colorful and imprinted promo items are very hard to miss out. 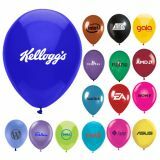 ProImprint offers a sizeable collection of custom latex balloons that will add a festive flavor to your brand promotion. Call us at 844-776-4677 or email us at info@proimprint.com and we will help you find the perfect choice that match your brand theme.